This is my Frankennotebook. 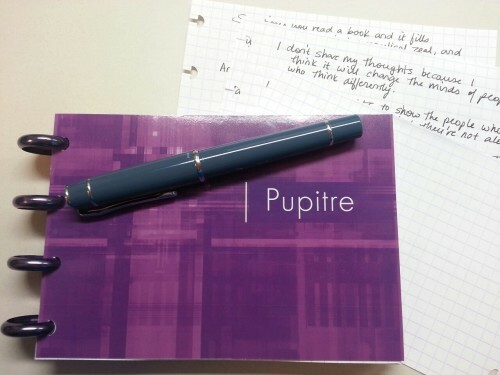 I took a Clairefontane Pupitre grid notebook I loved the paper in, but wanted something smaller and more portable. So I chopped the pages in half and Circa-fied it using my Staples Arc punch and some Levenger discs I had laying around. Much better. P. S. – of all the pics I’ve taken of my slate gray Pilot Prera, this one by far is the closest in terms of showing how light a gray it really is.